Since pumpkin is the flavor of the season, and you may be looking for anyway to enjoy it, why not make some pumpkin pie..for your lips? 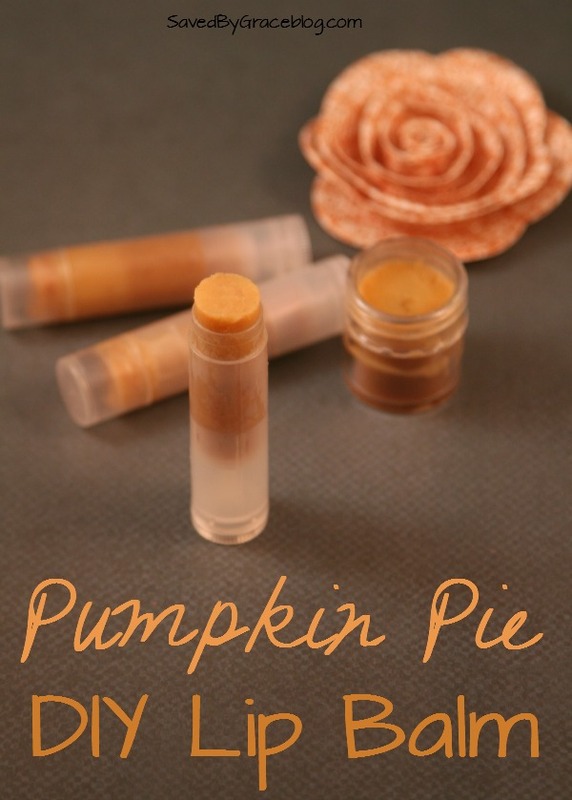 I had a lot of fun making lip balms the last time, but wanted to make one that was more seasonal and I thought of pumpkin pie since Thanksgiving is just around the corner. I looked for other recipes that were similar as I didn’t want to copy anyone, but all the other recipes didn’t call for actual pumpkin. That really wasn’t a surprise as most pumpkin pie scented goodies and products really are just the spices that are in pumpkin pie and not the actual pumpkin. The thing is, pumpkin is rich in antioxidants and it is great for your skin, so I figured to make these lip balms more authentic, I wanted to add in a bit of actual pumpkin to them. (In case you are wondering, I haven’t had any issues with the balms spoiling, I think because the bees wax kind of keeps it safe). 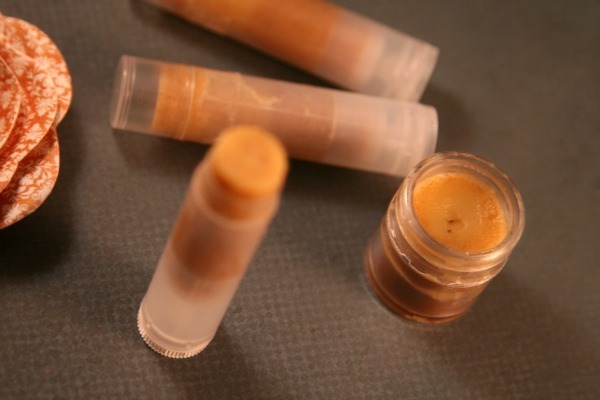 If you are trying to get all the pumpkin things you can, why not try making these pumpkin pie lip balms for yourself and your friends? 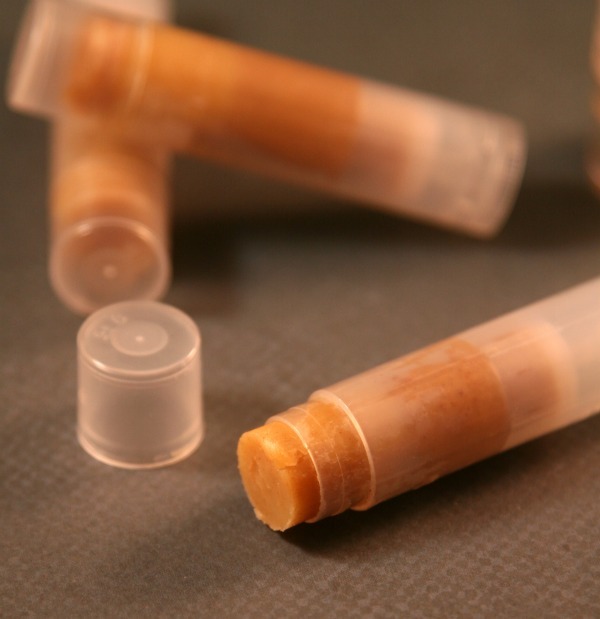 This recipe makes about 8 balms in tubes so you will have plenty to share! You can get the lip balm tubes from Amazon. I was lucky and able to find them at my local co-op, but I have never seen them anywhere else. Beeswax can be purchased on Amazon as well, or you might try looking at natural grocery stores, too. I find the online prices are usually a bit better, though. You will need to make a double boiler for this. I usually just use a glass measuring cup and an old pot for my crafting. It works well. Use a bamboo skewer to stir. You will also want to get a grater that you just use for crafts as the beeswax can be tricky to remove. Alternatively, you can purchase beeswax granules. 1. Add the beeswax and coconut oil to your measuring cup. Place it in a pot with water and bring it to a simmer. Stir, and allow the wax and coconut oil to melt. 2. Once it is well melted, add in your pumpkin puree. Using a small whisk or fork, mix it in vigorously until it is no longer separated. 3. Add in your spices and vanilla extract. Mix it all well. Allow to sit for a few minutes to settle any bubbles that may have formed. Give a gentle stir. 4. Grab the measuring cup with a potholder and pour into your tubes. Don’t overfill them, but try to get it right to the top. 5. Allow to set up before moving the tubes. It should set up completely in about 15 minutes, but you will see it solidifying almost right away. Cap them once they are cooled. Don’t they look lovely and delicious smelling? This recipe makes 3-4 tubes of lip balm. Yes, this stays solid under normal household temperatures. I wouldn’t leave it in a hot car or in extreme heat because with any lip balm, commercial or homemade, it would melt. I personally have not had this melt in my home, though. I haven’t had it go bad. Its been a year since I made it and it still smells fine to me and not rancid. Hi Cassidy, It doesn’t really matter as it isn’t an ingredient in the actual lip balm. It would depend on your pot size. I usually just fill my pot about half full and that works for me. Does the puree give it a pumpkin flavor or could I replace that with a pumpkin seed oil instead? Hi Kathryn, It does give it a subtle pumpkin flavor. I honestly don’t know if you could replace it with pumpkin seed oil as I have no experience with doing so here. I would worry that it would be too much oil to wax ratio and it wouldn’t set up correct. Hi! Does the orange pumpkin purée tint the lips? Hi Charity, No, it doesn’t offer any tinting at all. Do you think I could replace the coconut oil with shea butter in this recipe? Hi Bailey, I wouldn’t simply because when looking for substitutions for DIY like this, you have to consider a couple of factors; consistency and melting point. Shea butter melts at a higher temperature with coconut oil melting at about 70 degrees. Additionally, the consistency of Shea butter is different and might alter the outcome. Is this really only 1 tsp pumpkin purée? I made this recipe and mine are nearly as orange as the picture. Hi Krystal, If you mean they aren’t as orange as the picture, I’m not sure why. It could be that I used homemade pumpkin puree rather than canned. Thanks! This recipe turned out far better than I anticipated. 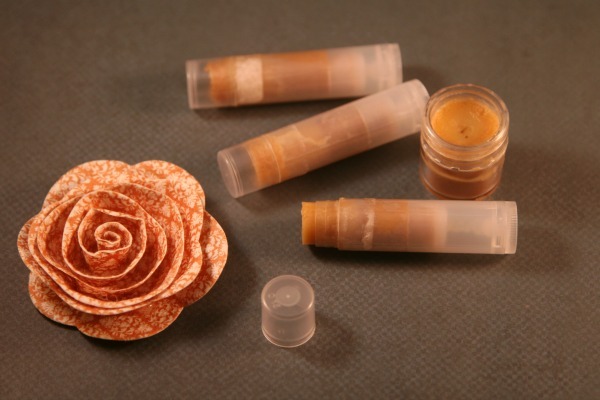 Will be making multiple batches for Harry potter-inspired pumpkin pasty lip balm to give away at Christmas. I just made this and it smells amazing. Hi Heather, I’m really glad you like it! How many lip balms does this recipes make? From my memory, I recall it making 3 or 4 regular sized tubes. Thank you. Very excited to make these. Just got the stuff to do them. I made it but they came out really more a brown and it made way more than 3-4. I don’t know if I did something wrong or what. But I will keep trying.